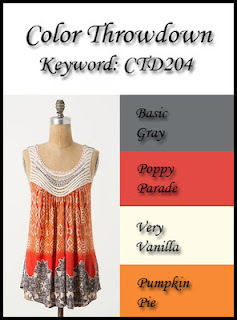 I translated the colors into PTI as Smokey Shadow, Pure Poppy, Vintage Cream and Orange Zest. I got out PTI's Lovely Layers to play with, and added the "Wonderful friend" sentiment from a Think Big Favorites set on a WPlus9 banner die-cut. The checkered background is from Waltzingmouse Stamps. I also used PTI's Limitless Layers: Squares dies, and popped up both the squares layer and also the Lovely Layers grouping. Thanks for the great color combo, Color Throwdown! And thanks for stopping by!